An accomplished artist, E.C. Wynne thrives on sculpting wildlife. Her whimsical pieces all share a desirably common warmth. The sensitivity and soulfulness of each piece is apparent in the affable expressions on her subjects' faces. Wynne's reverence for and love of nature is expressed in every discernible detail found in her creations. Her astute attention to detail is evident in the scaling and anatomical correctness of her work but it is that magical sparkle that brings each piece to life. The merry quality Wynne instills in her work keeps admirers and collectors alike waiting to see what adorable creation she will come up with next. E.C. 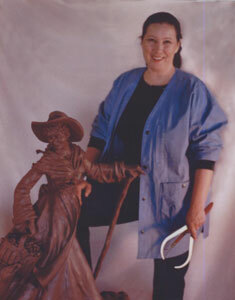 Wynne began her career as an accomplished and award-winning illustrator/designer. Wynne created artwork for notable companies such as Children's Workshop, Sesame Street, the Coors Company, and Fujiya Co. of Japan. She also designed the Endangered Species official t-shirt, and several childrens' books, which were printed in five languages and sold worldwide. Wynne won several national awards, including the Printing Industries of America Graphic Arts Award and the National Printers' Association Award.